A stress-free way to enjoy home Seahawks games for all 12s! 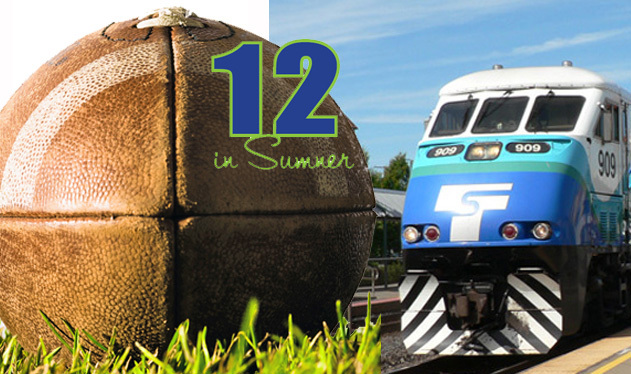 Ride the Sounder Train from the Sumner station. Trains leave Sumner’s station at 10:37 and 11 am. You can purchase tickets at the kiosks the week before and avoid the long line on game day. To get ready for a fun day of cheering, you can get breakfast in Downtown Sumner at The Buttered Biscuit, opening at 6 am or Mignon’s Cafe, opening at 7 am. After the game, Stuck Junction Saloon is open until 10 pm, Trackside Pizza until 10 pm and Sorci’s Italian Cafe until 8 pm on Sundays. All are within walking distance of the train station. And, if you aren’t lucky enough to live in Sumner, you can stay at the Holiday Inn Express & Suites and use their shuttle to the station for a full day at the game with no parking worries at all!